James Belflower’s poetry chapbook, Bird Leaves the Cornice, questions our relationship with language by examining the last line of Brent Cunningham’s poem, “Bird and Forest” which reads, “I hope I have not suggested, so far, that the/ bird might be flying away from something.” Using various architects’ theories on the phenomenon of the contour, Belflower builds on the allegory of the bird leaving the cornice. The main theory is described as: “every contour is a continuous line which closes in upon itself somewhere on the earth’s surface though not necessarily within the limits of a drawing or photograph.” Belflower chooses to substitute the word “contour” for “cornice,” while meditating on the idea of the contour never closing in on itself, much like the letter “C.” We seek meaning in the anagrams of “contour” and arrive nowhere until we eliminate the “C,” in which we end up with “not our,” if we divide the word symmetrically. Although the contour is never supposed to split: Belflower keeps us guessing. It is not until he writes, “is a word a continuous line that closes in upon itself not necessarily within the limits of a word?” that we feel we are getting closer; closer to the bird. It is not until we ruminate on the word “US,” that Belflower decides this word signifies a contour for a cornice – when we separate the “U” from the “S” what exists in the space between can only be the bird. If the bird exists here, within this contour, then it is not trying to leave the cornice at all (as Cunningham’s poem suggests). 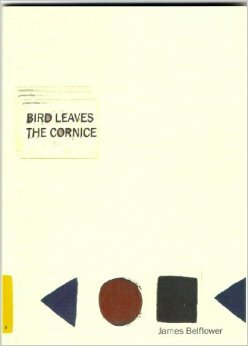 And yet – what does it mean, for the word, if the bird does leave the cornice? The bird leaving the cornice will split the contour, will break down the language and subvert its very meaning. A word is only a word, after all. First you will need a stage, but you don’t necessarily need an audience. The light must be bright enough and at just the right angle to cast shadows of your body on the stage. The soles of your shoes must be painted black; still wet. Start walking in a circle. Make three left turns, and then a right. Make three right turns, and then a left. Keep going, so it’s one swift figure eight. Do this with your arms spread out shoulder-length, parallel to the ground, as if you’re soaring – keep arms steady – this is very important. As you’re doing this try and imagine where the bird is, and take note of the shape of the room. If the ceiling is as circular as your movements, you’re in trouble. Envision what the alphabet looks like; in particular, vowels. Imagine what it would be like if you were the letter C, and you probably could be, if you ever stopped walking. Your shadows trace the stage with their relentless circling, and soon you become the homeless bird that James Belflower ponders. Nevermind, you’re not the bird. Only you really wish you were the bird. James Belflower writes to you, “TO PERFORMER: Pause for 4 seconds to allow audience to concentrate.” (7, Bird Leaves the Cornice.) Where is your audience? Think about this. James Belflower is the winner of the Spring Gun Press Chapbook Prize and the Phyllis Hurd Liston Poetry Prize for his chapbook, Bird Leaves the Cornice, and is also the winner of the Juked Magazine Poetry Prize. His other publications include And Also a Fountain (2008) and Commuter (2009). 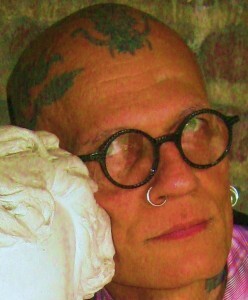 Belflower curates potlatchpoetry.org and is currently pursuing a PhD in Poetics from SUNY Albany. His forthcoming work will appear in: New American Writing, EOAGH, Apostrophe Cast, First Intensity, Reconfigurations, Konundrum Engine, O&S, and Packingtown Review, among others. Reviewer: Hannah Kezema is a first year MFA student in the Jack Kerouac School of Disembodied Poetics at Naropa University. She graduated from The New School in 2012 with a BA in Literature. Her poetry has been featured in the CORE International Journal of the Humanities, distributed in Paris. We hope to see you next Tuesday for our final What Where Series of the semester! Michael du Plessis teaches Comparative Literature at USC and is the author of The Memoirs of JonbBenet by Kathy Acker, the chapbook Songs Dead Soldiers Sing, and, as Vanessa Place, as part of Place’s “Factory” series, the chapbook, Thank You for Reading. J’Lyn Chapman’s essays and prose poems have been published in Conjunctions, Fence, Sentence, and American Letters & Commentary, among other journals. Calamari Press published the chapbook, Bear Stories. An essay derived from her doctoral dissertation on W.G. Sebald is forthcoming in a collection calledThe Language of Images. She is Visiting Instructor in the Jack Kerouac School at Naropa University in Boulder, Colorado and edits the online poetics journalSomething on Paper. Naropa University welcomes participants with disabilities. Please contact Ariella Ruth at agoldberg@naropa.edu or 303-546-3581 to inquire about accessibility and discuss disability accommodations needed to participate fully in this event.